Graphic design as a profession has evolved quite significantly over the past 10 years or so. With the emergence of the digital sphere and a decreased focus on print design, communication designers have begun asking important questions about where their profession fits within the commercial world. Where is graphic design heading and what does it mean to be a designer in the world of the future? Graphic designers are essentially message-makers. They are commissioned to communicate a message to a particular audience or market. And so they create powerful pieces of visual communication e.g. a brochure, a website, a poster, a logo to provide a sense of what something means, and even to change the viewer’s ideas of right and wrong, buy or don’t buy (but mostly buy). With this kind of power comes a form of social responsibility, which is slowly being acknowledged in the world of design. So how can a graphic designer be responsible, in an ever-changing and increasingly globalised world where messages travel far and wide and deeply effect the social and physical world we live in? Well they can be green of course! 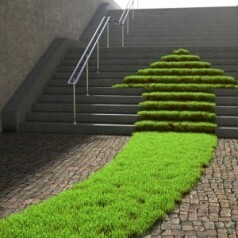 Green graphic design, sustainable graphic design, eco graphic design, environmental graphic design. Whatever you prefer to call it it’s essentially all the same thing: design that is focused on reducing carbon emissions and promoting general wellbeing and social equality. Sustainability is the idea of enabling the continuity of human life on Earth as we know it. This means achieving a perfect balance of environmental, social and economic wellbeing. And so ‘sustainable design’ is a form of design practice that follows a specific philosophy, policies and guidelines that will ideally help humans to achieve this. Think about more than just commercial cost. The cost to the environment may far outweigh a small monetary saving for printing your design on unsustainable paper. Ensure that actually printing something is the best way to achieve your desired result. Perhaps it will work better to do an email campaign this time? Check if you can multi-purpose your printed items. Can one publication or printed item serve multiple purposes, and prevent the need to use more resources? Consider paper sizing. How can you best utilise the space on a page and print on the smallest paper possible to still achieve your desired result? Avoid unnecessary toxic coatings and metallic inks, and try to design for minimal ink coverage where possible. Find out if and how the printed item can be re-used or recycled. Commit to being a responsible message-maker. Don’t design to promote untruths or something you feel is morally or ethically wrong. Give back where possible. Donate 10 per cent of your time or profits to a cause that is achieving something good. Share your knowledge and passion about designer responsibility. Green your office and use energy-saving equipment. Here are some resources on where you can find more information on sustainable graphic design. Many graphic designers in my home city of Melbourne are progressing into the area of eco or sustainable graphic design, but Australian designers are still a long way off taking a more ethical stance. It’s a bit embarrassing to be so far behind many other countries in this field. So if you are a designer or someone who uses one, don’t be afraid to be different! Eco-design costs and looks the same as conventional design, it just involves thinking outside the box and remembering who and what your message will effect. What better way to add value to your business than to market yourself ethically. Think about that, and then think about what message you wish to send. Sonja Meyer is an Australian Eco-Graphic Designer who holds a Diploma of Arts in Graphic Design, a Diploma of Sustainability and a Graduate Diploma in Design Anthropology. Sonja is based in Melbourne and specialises in design for environmental organisations and other NGOs. Visit her website www.sonjameyer.com.au for more information.